A 37-year-old G4P2A2 Hispanic female presents for her initial obstetrical visit at a gestational age of 12 weeks and four days. She has a history of one therapeutic abortion and one spontaneous abortion (third pregnancy). The patient is blood type O-positive, has an equivocal rubella titer and tests positive for tuberculosis (QuantiFERON). 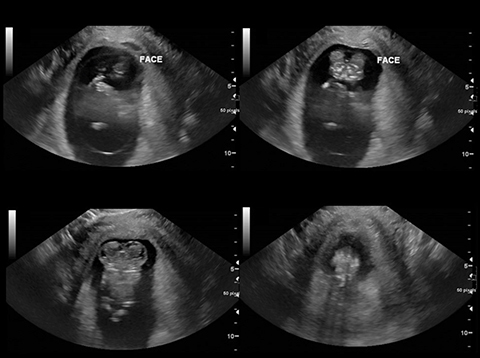 Grayscale transvaginal ultrasound demonstrates a fetus with duplicated maxillofacial and calvarial structures fused at midline (Figure 1). There is a solitary heart with shared intracranial vasculature, two upper and two lower extremities (Figure 2). Conjoined twin pregnancy of the parapagus dicephalus dibrachius dipus (PDDD) type. This type of conjoined twin is defined by lateral fusion with two heads, sharing a single thorax, abdomen and pelvis with two arms and two legs. Conjoined twins occur in approximately 1 percent of monoamniotic monochorionic monozygotic twins.1 The reported global prevalence ranges from 1:50,000 to 1:100,000 births.1,2 Of the small number of conjoined twins born alive, there is a 30 percent mortality rate within the first 24 hours of life.1 Overall, there is a 2:1 female predominance of conjoined twins. Other findings suggestive of conjoined twins include: An umbilical cord with greater than three vessels, persistence of fetal position and anatomy relative to one another on repeat scans. Identification of shared organs is critical in guiding management as the main clinical dilemma is determining if the twins can be surgically separated. Multiple case reports encourage the use of three-dimensional sonography to diagnose conjoined twins.1,6 Three-dimensional sonography improves specificity regarding the level of fusion and degree of shared anatomy. Three- dimensional sonography also aids in parent counseling as it helps demonstrate disease severity and illustrate reason for prognosis. 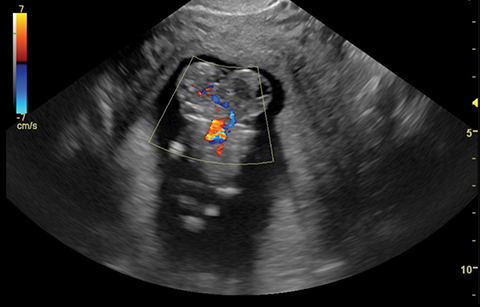 The early diagnosis of a conjoined twin pregnancy is important in guiding clinical management. 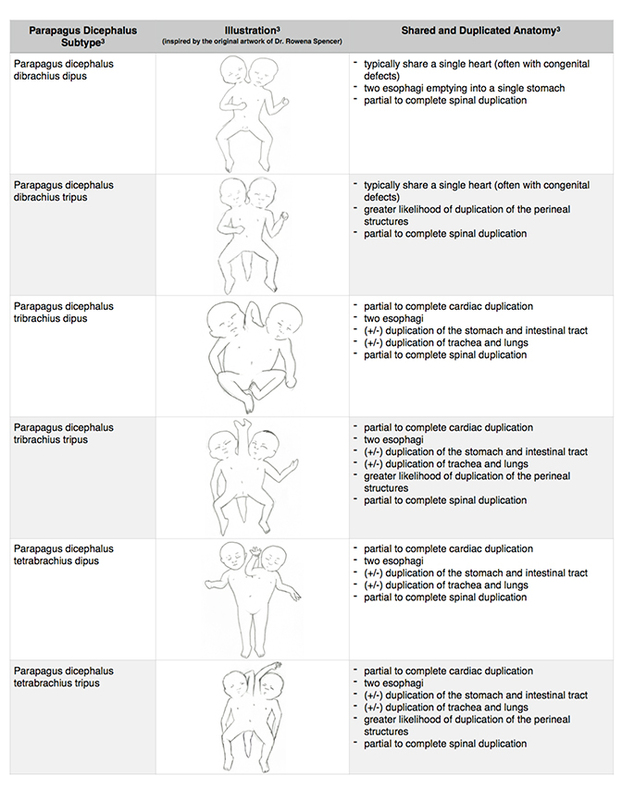 Classification of conjoined twins is a relatively simple system based on sites of fetal union. Establishing a correct diagnosis and identifying shared organs will help determine the possibility for fetal separation and minimize morbidity. Bega G, Wapner R, Lev-Toaff A, Kuhlman K. Diagnosis of conjoined twins at 10 weeks using three-dimensional ultrasound: a case report. Ultrasound Obstet Gynecol. 2000 Sep;16(4):388-390. Mutchinick OM, Luna-Muñoz L, Amar E, et al. 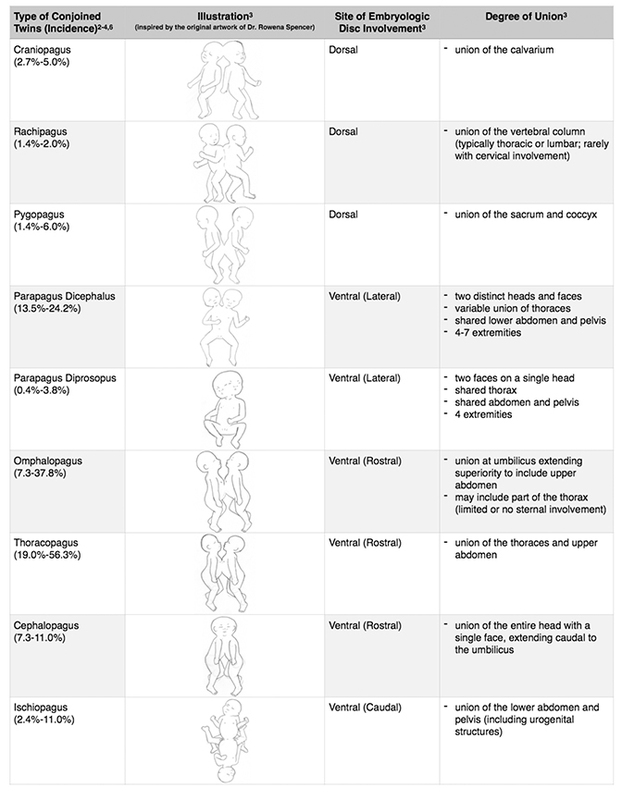 Conjoined twins: a worldwide collaborative epidemiological study of the International Clearinghouse for Birth Defects Surveillance and Research. Am J Med Genet C Semin Med Genet. 2011 Nov 15;157C(4):274-287. Spencer R. Theoretical and analytical embryology of conjoined twins: part II: adjustments to union. Clin Anat. 2000;13(2):97-120. Chen CP, Hsu CY, Su JW, Cindy Chen HE, Hwa-Ruey Hsieh A, Hwa-Jiun Hsieh A, Wang W. Conjoined twins detected in the first trimester: A review. Taiwan J Obstet Gynecol. 2011 Dec; 50(4):424-431. Tongsong T, Chanprapaph P, Pongsatha S. First-trimester diagnosis of conjoined twins: a report of three cases. Ultrasound Obstet Gynecol. 1999 Dec;14(6):434-437. Yang PY, Wu CH, Yeh GP, Hsieh CT. Prenatal diagnosis of parapagus diprosopus dibrachius dipus twins with spina bifida in the first trimester using two- and three-dimensional ultrasound. Taiwan J Obstet Gynecol. 2015 Dec;54(6):780-783. Byers CDA, Young JR, Connell M. Parapagus dicephalus dibrachius dipus conjoined twin case. Appl Radiol. 2018;47(5):29-32. Prepared by Mr. Byers while a 4th year medical student at the University of Arizona College of Medicine, Phoenix, AZ. ; Dr. Young while a Radiology Resident, and Dr. Connell while serving as the Radiology Residency Program Director, Associate Professor of Radiology, and Section Chief of Ultrasound at Maricopa Medical Center, Phoenix, AZ.